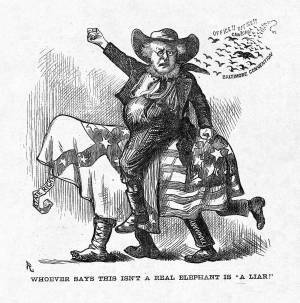 This cartoon is apparently only the second time that the symbol of an elephant was associated with the Republican party. The first was in a Republican campaign paper, Father Abraham, in 1864. In this case, it symbolizes the breakaway Liberal Republican party, which presidential nominee Horace Greeley insists is "a real elephant." The cartoon appeared (July 17) about a week after the Democratic convention had also nominated Greeley for president. It shows that the Liberal Republican Elephant is actually a fraud consisting of Democratic elements: States Rights, the Ku Klux Klan, and Tammany Hall, all covered by the Confederate flag. The birds of prey in the background sky reveal that the Democratic goal in nominating Greeley is the power and patronage of political office.